When You Must Have a Miracle! Have you ever been at a critical point in your life or in a situation that looked almost hopeless? Maybe you even wondered if God could really take what seemed impossible and make it possible? 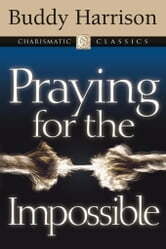 Our God is the God of the impossible, but He expects us to do our part and pray. In Praying for the Impossible, Buddy Harrison shares from his life experiences how he petitioned his heavenly Father through prayer and saw God move on his behalf. It&apos;s not enough to know what to pray for - we must know how to pray. Harrison effectively explains that different needs require different types of prayer, and each has it&apos;s own guidelines. Praying for the Impossible contains solid, biblical teaching on the prayer of supplication and how we as believers can petition the Lord on our behalf. You will learn: * The value of writing your own petition to God * The different forms of prayer and how to use them * How to get your prayers answered * How to make certain your prayer is in line with God&apos;s Word. What is your need? What is your miracle? With the life-changing principles in this prayer manual, you will find your dreams are a reality as you begin by Praying for the Impossible. Its an awesome book short yet very fulfilling and I learned so much. This book is a blessing to getting your prayers answered and I thank you Lord for leading me to this book. Buddy, you are wonderful it was a book that you need to go back to read at all time. Tells about the unstoppable power of God.